With back-to-back film commitments and releases, handsome hunk John Abraham is one of the busiest Bollywood actors. Recently, John revealed his various avatars from his next ‘Romeo Akbar Walter’ (RAW) and left all his fans raving over the outstanding film posters and teaser. In the meantime, John was busy shooting his upcoming film ‘Batla House’. ‘Batla House’, which is directed by Nikkhil Advani, will see John Abraham playing the role of the controversial cop, Sanjay Yadav. And now, the makers have announced the film’s completion. Also, noted film critic Taran Adarsh took to his Twitter account to share a glimpse of the ‘Batla House’ set. The film is based on the life of a cop named Sanjay Yadav who was blamed for an encounter. The incident took place against the Indian Mujahideen terrorists in Batla House locality in Jamia Nagar, Delhi on September 19, 2008. 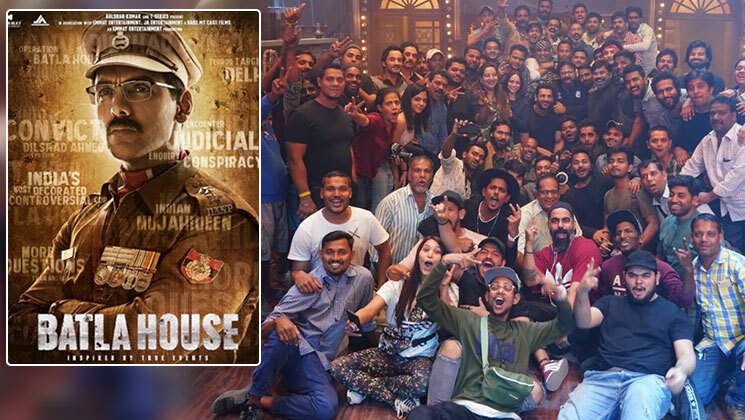 ‘Batla House’ is slated to release on August 15, 2019. It is to be noted that John Abraham has been seen in films like ‘Satyameva Jayate’ and ‘Parmanu: The Story of Pokhran’, which have been high on patriotic content and this film will no doubt only add to that list.